We’re all a bit under the weather at the moment and in need of some proper winter comfort food. Rice pudding was a regular in our house when I was young – my mum would cook it in the oven for ages when she was making the Sunday roast. I don’t cook roast dinners (the kids don’t really like it and it seems a lot of effort to go to for them not to eat it) and I rarely have the oven on for long enough to justify making a rice pudding. It’s amazingly easy to make in a slow cooker, though. This recipe uses pudding rice. It’s shorter and fatter than regular rice and it’s easy to get hold of at the supermarket. I’m not sure if this recipe would work with normal rice, but I’m not going to try it because I like rice pudding too much to have to throw it away if it didn’t work out! I’ve flavoured it with nutmeg because that’s how my mum cooked it but if you don’t like it then of course you can leave it out. If you prefer you could add a spoonful of jam or some chopped fruit after its been dished up, or at this time of year try stirring in two or three tablespoons of mincemeat for the last hour of cooking. I like my rice pudding quite thick so cooking it for 3 1/2 hours was perfect for me. The rice was cooked after 3 hours, though, so if you prefer a pudding with more liquid reduce the cooking time. If you want a skin on your rice pudding then leave it to stand for 5-10 minutes. It won’t get a thick skin like a baked pudding, though, because of the way it is cooked. Rub the inside of the slow cooker with the margarine to coat it. Leave the remaining margarine in the bottom of the slow cooker. Add the remaining ingredients and give it a stir. This image contains a link that will take you to Amazon.com. I am a participant in the Amazon Services LLC Associates Programme. This means that if you make a purchase from Amazon after clicking on this link I may make a commission. Mmm what a delicious winter warmer, I always loved rice pudding as a child, especially the skin on top. Yum! 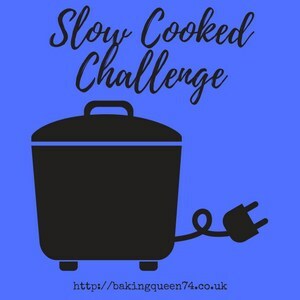 Thanks so much for sending your recipe over to the Slow Cooked Challenge again this month. I love the childhood memories it brings back 😊. Happy to be able to join you on the Slow Cooked Challenge. Love a goid rice pudding but haven’t been able to pull it off well. Usually just turns out like rice in milk. Blah! Is there a trick or is there a better rice for making it than others? Your looks great! I’m just stumped!